Experience the Kapampangan regard for the culture and the arts. Taste the rich and exotic Kapampangan cuisine. The Bisitang Angeles Heritage Tour will provide both experiences. The guided walking tour will go to seven historical sites in Angeles City. 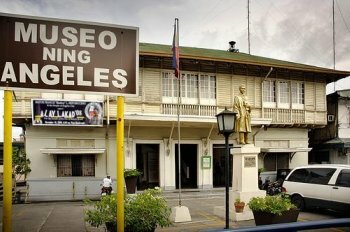 The Museo ning Angeles was the old city hall. It showcases the history, lifestyle and culture of the Angelenos. It houses the Balikdan Exhibit which is a chronological account of the events that led to the cityhood of Angeles. The Diorama of Kapampangan traditions depicted by Munikas or the Ninay dolls of designer Patis Tesoro. The Reynaldo Alejandro collection of cookbooks and the Culinarium which exhibits antiquated cooking utensils and holds cooking demonstrations. The tour proceeds to the Pamintuan Mansion where President Emilio Aguinaldo celebrated the first anniversary of the Philippine Independence. Bale Matua built over 180 years by Don Angel Pantaleon, founder of the city. Camalig Restaurant, an old grain house built in 1840 now a restaurant serving the best pizza. Holy Rosary Parish Church, constructed in 1877 and used by the US Army as a hospital in 1899. Bale Herencia with its colonial architecture, now a venue for various celebrations. Finally, on to the Holy Angel University Centre for Kapampangan Studies which researches and promotes the Kapampangan heritage and culture. Lunch is served with the guided tour. The menu consist of Ensaladang Paku or Edible Fern Salad, Pindang Damulag, Kari-karing Dagat, Ning –nang Tilapia, buro and vegetables, Pititsan or Pork Rind, atchara, fruits, rice and a bottle of mineral water. For those who want to have only merienda, they may choose Merienda A which consists of pancit luglug, and puto. Merienda B serves fresh lumpia and mamon tostado in addition to pancit and puto.